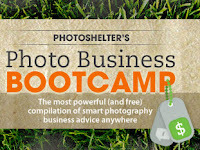 November 4, 2011 /Photography News/ PhotoShelter just launched the Photo Business Bootcamp, a compilation of free photography business advice packed into five weeks of free online business courses for photographers seeking guidance to grow their businesses and drive more revenue. The 5-week free email series for photographers contains 40+ curated interviews and tutorials from the most respected photography and industry experts in the business. The Bootcamp includes courses on how to find inspiration, grow your photography business, improve your website, master online marketing, and sell your photos to increase your bottom line, featuring blog interviews, tutorials, webinars, and videos with contributed insights from some of the most respected photographers, business consultants and marketing professionals in the industry. Photo Business Bootcamp participants will receive a weekly email over the course of five weeks following their registration date. PhotoShelter's Photo Business Bootcamp will run indefinitely. I just sign up for this, it really looks like a great resource of information. Tomorrow I should receive the first week email, we will see how good it is!